A baby massage is usually performed by a parent and it is crucial to know the precautions to take when massaging a baby. Parents don’t typically bring their baby in for a professional massage because you never know if the baby will accept the massage from a stranger! I asked our expert massage therapists about precautions parents should take when massaging their baby. Professional massage therapists are trained to take specific precautions, but rarely massage babies. In fact there are massage therapists who teach baby massage techniques and precautions to parents. In this article I will cover the precautions for baby massage in detail and will also provide simple baby massage techniques you can use today! Baby massage is an excellent way for parents to bond with their baby. The contact and intimacy that baby massage creates is beneficial for both the parents and the baby. In fact a study showed that massage therapy led to weight gain in preterm infants when moderate pressure was applied, which in turn helped them recover faster. Avoid high surfaces like tables, changing tables or even a bed. It is best to massage your baby on a blanket on the floor. Or you could sit down on the floor and lay your baby on your lap. The primary reason for this is safety. If you insist on massaging on a high surface, make sure your baby cannot roll over, by placing pillows around your baby. Use gentle to moderate pressure and massage your baby for 20-30 minutes following the techniques I will cover in this article. Although moderate pressure is recommended for preterm infants, only use gentle pressure with normal infants. Always remember the baseline, when it comes to massage you are stronger than you think and the pressure you apply might be hard. Never force your baby to receive a massage. In fact most practitioners advice that you first get your baby’s permission. To do this take a little massage oil and applying it on your baby’s navel and behind the ears. See your baby’s reaction and body to judge whether you have his/her permission or not. You can ease them into accepting the massage by singing to them or playing with them. Never add essential oils used for aromatherapy to the massage oil if you are new to using essential oils. The essential oils are too strong for the baby and it is inevitable that your baby will get some oil into his/her mouth as they have a tendency to put their hands in their mouth. Later on in this article I will explain the correct way to use essential oils for babies. Use Jojoba oil or grape seed oil for the massage because these oils are odorless. Most hospitals will provide you with olive oil to rub on flaky skin of new born babies and you can continue using olive oil for massage as well. Avoid any oils with heavy scent. There are several massage therapists and practitioners all over the world who teach new parents the art of baby massage. I highly recommend taking a few sessions to learn the techniques to massage your baby. If you are in London you can contact us to set-up a session. I will now show you 3 basic baby massage techniques. The stomach massage technique can be performed after the face and back massage. 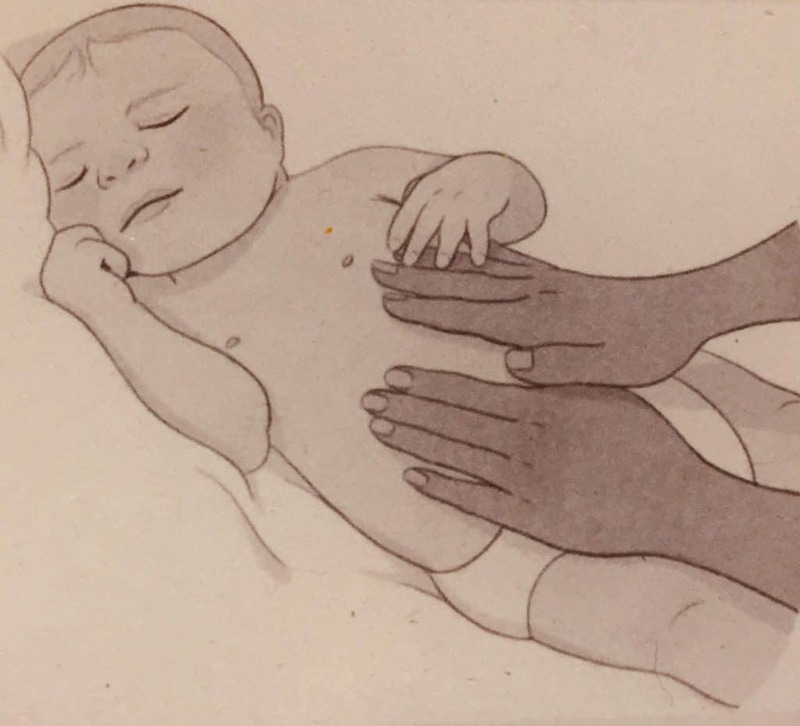 However you can use the stomach massage technique for babies independently especially for colicky babies. This massage technique is very helpful to soothe their stomach and intestinal discomfort. Place your baby on its back on a blanket on the floor. You can perform all the 3 techniques shown in a single session. Make sure to take the precautions listed and also use the special baby massage oil formula shown. Following these instructions you and your baby will have many massage sessions that you will cherish. We generally discourage the use of essential oils for babies and infants mainly because most people do not know the correct way to use and apply essential oils on babies. However using essential oils for babies can be very effective if done correctly. Use a glazed diffuser and not clay porous diffusers. Mix one drop of essential oil with a tablespoon of water and pour this mixture in the diffuser bowl. 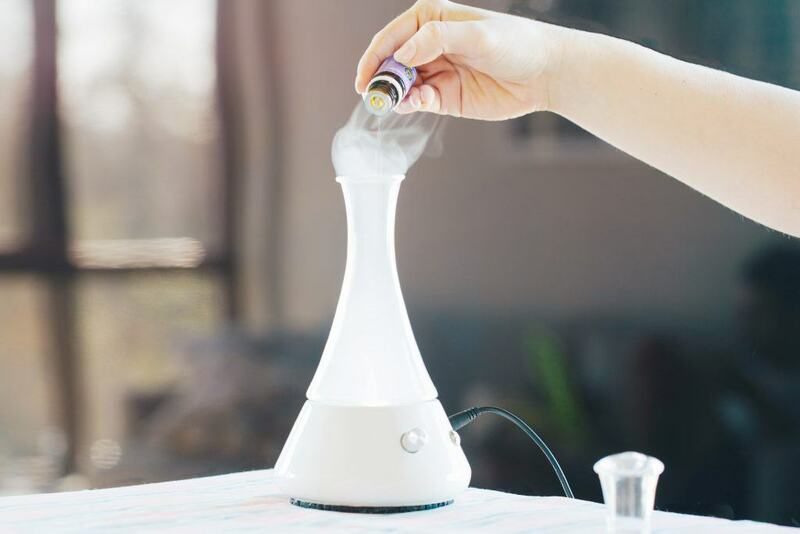 Never use only essential oil without mixing with water as the heat from the diffuser will evaporate the essential oil completely and this will be too powerful for the baby. Never apply neat essential oil directly on to your baby’s skin. If you wish to use essential oils in combination with a base oil to massage your baby you will need to heavily dilute the essential oil. You can see a sample baby massage oil formula in the related questions section. 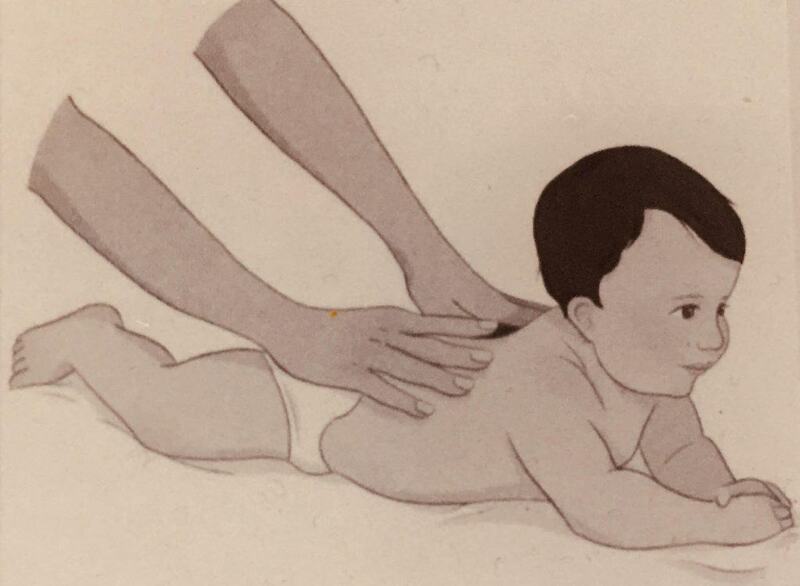 Does massage help a baby grow? There has been research which shows that massaging a preterm infant will lead to weight gain. Moreover a baby massage is performed by a parent and touch and intimacy are beneficial for the baby. 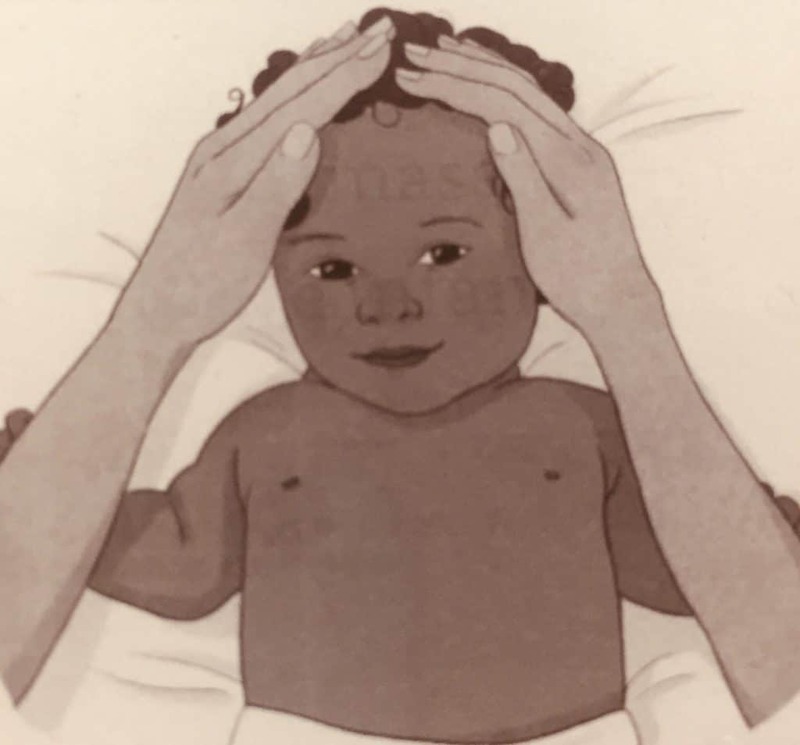 Due to these factors it is believed that massaging a baby will have a positive impact on its growth.